On a previous post, I listed ways we are being tracked without consent by search engines, browsers, mobile apps, social networks, TVs, games, devices, etc. Hopefully by now, you understand why we all should be concerned with security, ethics and privacy. 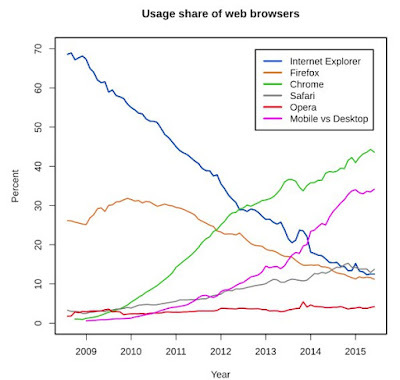 But before we discuss privacy and why we should reconsider Firefox, I thought it would be interesting to do a quick recap on web browsers, this omnipresent tool in our lives. Today, Firefox has about 13% market share. 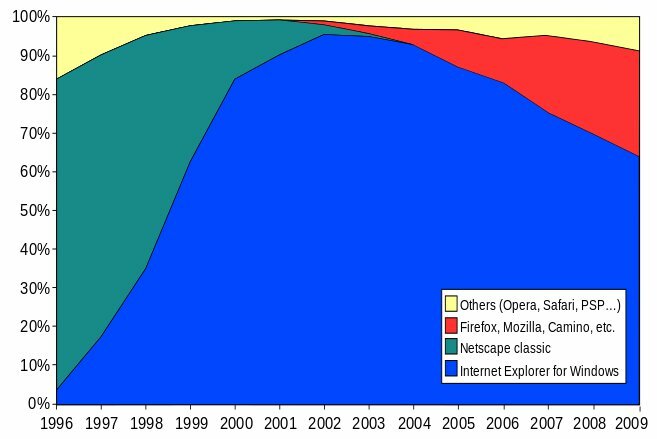 A huge decrease if we consider that it originates from Netscape, which had close to 80% of the market two decades ago. Back in 1995, Netscape sailed in calm waters until a Internet Explorer 1.0 was released by Microsoft. That was the beginning of what's called the first browser wars. By mid-1995, Netscape Navigator was the most widely used web browser and Microsoft had licensed Mosaic to create Internet Explorer 1.0 which it had released as part of the Microsoft Windows 95 Plus! Pack in August. Internet Explorer 2.0 was released as a free download three months later. Unlike Netscape Navigator it was available to all Windows users for free, even commercial companies. 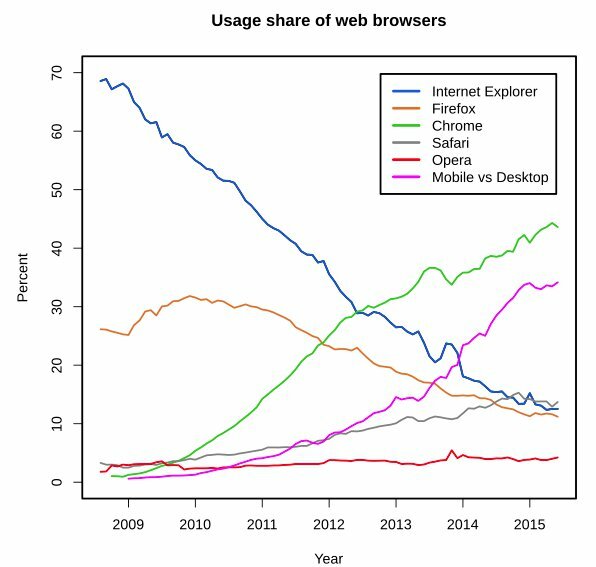 IE was bundled with Windows - since Windows had over 90% share of the desktop operating system market, IE quickly gained adoption. Microsoft was able to dominate the market share easily as customers had it as the default browser. This also brought an end to the rapid innovation in web browsers; until 2006 there was only one new version of Internet Explorer since version 6.0 had been released in 2001. The market remained stalled for a few years until a new contender entered the market: Google Chrome. Let's be honest: Chrome indeed brought us many advances. To name some: simple bookmarks and settings synchronization, web standards support, malware blocking, plugins, incognito mode, speed, stability, desktop apps, its web store, extensions, themes, automatic web page translation, release channels, frequent release cycles, etc. That's a lot! Because Chrome is embedded in Android (the most popular mobile OS), has tight integration into other Google services and to ads like the above, people keep ditching alternatives and just using Chrome. So how can we approach this problem? 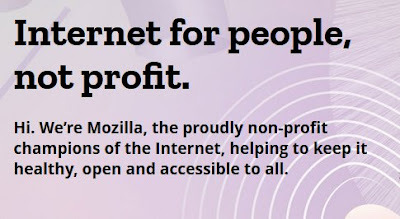 The solution is a more open Web, not a web governed by one or two companies but internet for people, not for profit. It has to include open standards, open formats, strong security and privacy that protect the users. It's internet for the people, not for profit. Unfortunately, the web today has problems. Security, ethics and privacy are not being respected and we should work together to improve it. And it will start with us, the users. 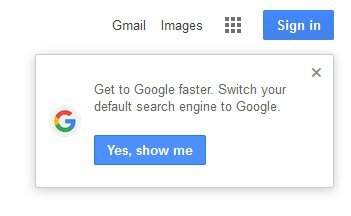 It should start with our search engines and with our browser. That's why my browser of choice is Firefox. Because I want my privacy respected, because I want a more open web, because I support open-source software, because it has excellent development support and it's super fast! To get better, Mozilla has been working on the Enhance Tracking Protection feature. Starting on Firefox 63, users will be able to block all third-party cookies so they are not tracked while browsing the web. We are being tracked without consent by search engines, browsers, mobile apps, social networks, TVs, games, devices, etc. Hopefully by now, you understand why we all should be concerned with security, ethics and privacy. There are alternative search engines and browsers that respect your privacy. Why not try and spread the word?